*Standard retail prices as of 3/5/2019. Prices and availability are subject to change and can vary by retailer. Night vision has come a long way. Instead of showing just green or shades of red and yellow—like night-vision goggles or thermal imaging—night vision security cameras give you a clear, sometimes colored image of your home in total darkness, inside and out. We’ve rounded up the best night vision security cameras to keep your home safe no matter the time of day. Night vision range 20 ft. 33 ft. 250 ft.
20 ft. 33 ft. 250 ft.
Data effective 3/5/2019. Details and pricing subject to change. The cam doubles as a Google Assistant smart speaker, and the two-way speaker has noise and echo suppression so you can hear loud and clear. The Nest Cam IQ Indoor has great reviews across the board, with smart features that set it apart. The cam doubles as a Google Assistant smart speaker, and the two-way speaker has noise and echo suppression so you can hear loud and clear. The IQ Indoor also has night vision up to 20 feet with 940nm IR LEDs, meaning you won’t ever be distracted by a faint red glow coming from the camera. Most of the Nest Cam IQ’s features require a subscription to Nest Aware. Plans start at $5 per month or $50 per year, which can get pricey on top of a camera that’s already expensive. But we think it’s worth it. With the Nest Aware subscription, you can access 24/7 continuous recording, customized person and familiar face alerts, and five days of continuous video history. ASecureLife recommends: Nest Cam IQ Indoor is a bit on the expensive side. But if you’re willing to shell out the cash (and pay at least $50 per year for a cloud subscription), we think it’s a great, reliable camera for any home. Dimensions: 3.8 x 2.3 in. Night vision: Up to 33 ft. 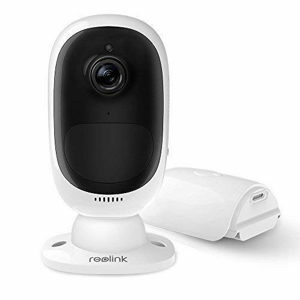 The Reolink Argus 2 is a compact camera with midrange color night vision that works both indoors and outdoors. It allows you to access most of its features for free through the Reolink app—no cloud subscription services here. Our favorite thing about Reolink’s Argus 2 is that it can be powered however you choose. You can use a rechargeable battery, a power adapter, or a compatible solar panel—a thoughtful way to power your camera outdoors. However, the Argus 2 is a 2.4 GHz camera and won’t operate on any higher frequency. Some users complain that this slows down their connection. ASecureLife.com recommends: Reolink’s Argus 2 is compact and versatile. Indoors, it makes a great fit for homes of all sizes. Outdoors, we’d suggest it for smaller residential properties. Dimensions: 2.8 x 7.1 in. Color night vision up to 150 ft. The Lorex 4K IP Bullet Camera is a solid security camera with long-range night vision, including color night vision up to 150 feet. And with 4K Ultra HD, the Lorex provides greater detail in digital zoom, which can be useful when looking for important details like a delivery person’s name tag or the color of an intruder’s shirt. We like that this night vision security camera includes a privacy-masking feature, which lets you choose what sensitive areas you don’t want recorded, like your bathroom or hot tub. It’s also the only night vision camera on our list with a 4K ultra high-definition resolution. But getting the most out of the Lorex 4K IP Bullet Camera can get pricey. The Lorex can work without a compatible 4K NVR (network video recorder)—starting at $249.99—but you’ll get more use out of the camera with an NVR. The Lorex also connects via Ethernet cable, so it may take some hardwiring or technological know-how. ASecureLife recommends: The Lorex 4K IP Bullet Camera may require multiple expensive purchases, but it will get the job done. We recommend this camera for businesses and larger homes. Arlo’s newly released Ultra can be used indoors and outdoors, has a rare 180° field of view, and records color night vision up to 20 feet. But unless you have to have a 4K camera—and don’t mind the high price tag at $399.99—our other night vision cameras fit into more budgets (and have comparable night vision capabilities). EZVIZ’s wireless security cam is highly rated on Amazon, costs less than 50 bucks, and has a night vision range of up to 100 feet. But too many users complain about glitchy and hard-to-use software for us to recommend it. A few variables go into a worthwhile night vision camera: image quality, infrared lights, a wide field of view, and the presence of ambient light. Image quality: A higher HD (high definition) quality gives you a clearer picture so you can see more of what’s happening in your video footage. 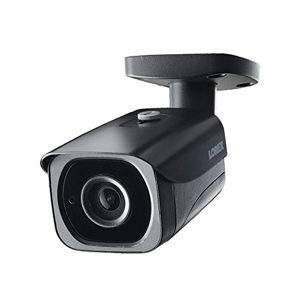 We recommend at least 1080p HD quality for any security camera. Infrared lights: Infrared lights—also referred to as IR lights or IR LEDs—are invisible to the human eye but act like a spotlight for security cameras with night vision, helping capture and reconstruct images in the dark. IR lights typically come in two different wavelengths: 850nm, which emits a faint red visible light; and 940nm, which is completely invisible. Field of view: The field of view (FOV) is the area a camera can see at one time. The bigger the FOV number, the wider the image frame is, allowing the camera to cover more area. Ambient light: Ambient light is the light present around the security camera. Natural light and street lights are both sources of ambient light. Color night vision requires ambient light for a clear, colored image. Investing in a night vision security camera is a great way to keep your home safe when it’s dark. The best night vision cameras use a variety of technologies—a wide field of view, infrared LEDs and ambient light—to construct a clear image no matter how dark it is. And the Nest Cam IQ Indoors does it best. The Nest Cam is a consistently impressive security camera that keeps its consumer in mind, and we especially like that Google Assistant is built into its speaker. >>Shed some light on your home. Buy the Nest IQ Indoor Camera. >>Want Nest coverage outside your home too? Learn more about the Nest Cam Outdoor.